A garden hose is fine for watering plants and rinsing off dust, but it lacks the power required for serious cleaning jobs. And a pressure washer has plenty of cleaning power, but is far too powerful for watering landscapes. Striking a happy medium between a garden hose and pressure washer is the ingeniously designed WORX Hydroshot Portable Power Cleaner. The Hydroshot comes with both 6-in.-long (top) and 18-in.-long (above) spray wands. It’s powered by a rechargeable 20-volt battery that delivers five times more water pressure than a typical garden hose. The unit’s precision pump delivers ½ gallon of water per minute, saving water without sacrificing performance. The Hydroshot can be connected to a garden hose or to the included 20-ft. siphon hose, which allows you to draw water directly from a bucket, pool, lake, river or any other fresh water source. It comes with a wide range of quick-mount accessories for tackling various cleaning and landscape watering jobs. The optional Turbo Nozzle ($30) delivers 360° of oscillating power for blasting away the toughest, grimiest messes. The Turbo Nozzle is ideal for spot cleaning stubborn surfaces, including concrete. The Hydroshot provides a quick, easy way to wash cars, trucks, boats, RVs, and motorcycles. It’s also great for washing windows, rinsing house siding, power-cleaning fences, decks, patios and outdoor furniture. And the adjustable nozzle allows you to water the most delicate plants without causing any damage. Use the 7-in.-long brush to power-scrub clean cars, trucks, boats, and house siding. 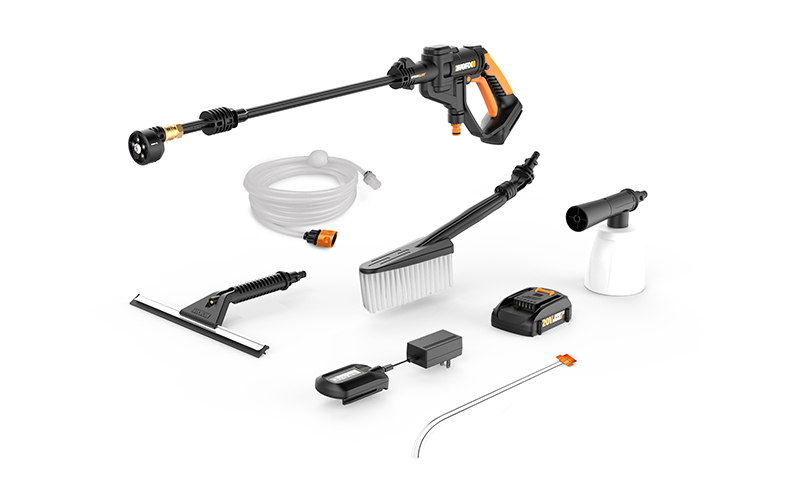 The Hydroshot Value Bundle (about $160) includes the Hydroshot Portable Power Cleaner, 20-volt battery, battery charger, and nine time-saving, grime-busting, accessories: adjustable multi-spray nozzle, gentle-spray short wand, pressure-enhancing extension wand, 20-ft. siphon hose, soft-bristle cleaning brush, soap-mixture container, window squeegee, durable mesh carrying bag, and bottle adapter that allows you to attach a two-liter soda bottle to the Hydroshot and then siphon liquid soap directly into the pressurized water stream. For more information, visit www.worx.com. WHERE CAN I BUY THE ACCERORIES FOR THE POWER SHOT ?